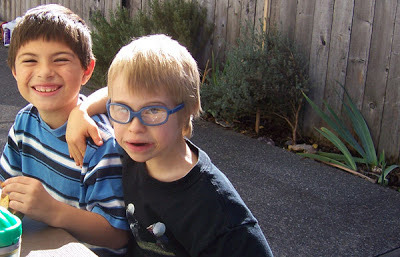 Photo of my son JJ and his buddy JG, by Lisa Nolan. 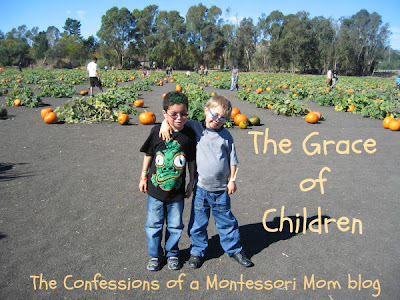 My special needs son JJ started attending public school Kindergarten a few years ago. I admit I was worried. Would the other children accept JJ in spite of his Down syndrome? Avoid him? Sneer at him? Make fun of him? Or worse, bully him? We hear stories practically every week about children who are bullied. And so the discussion begins, how do you react to bullies in school? But what we need to also talk about is how to teach children to be accepting of others who are different, who have special needs, or who just stand out in the crowd. 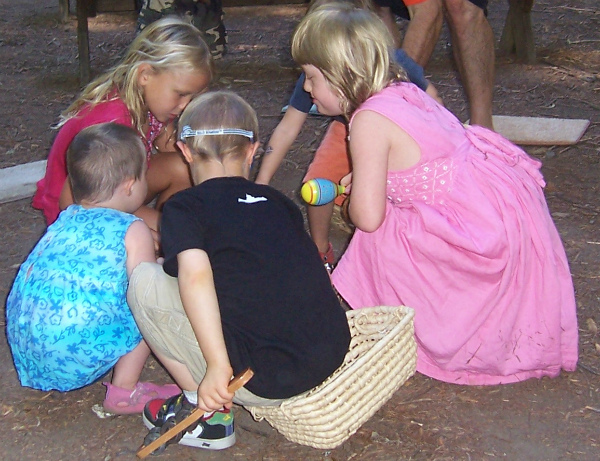 According to Montessori child development, at around age five, children begin the developmental transition to the Abstract Reasoning stage. More broadly, five-year-old begins the "Why, mommy, why?" phase. Why is the sky blue? What makes the wind? 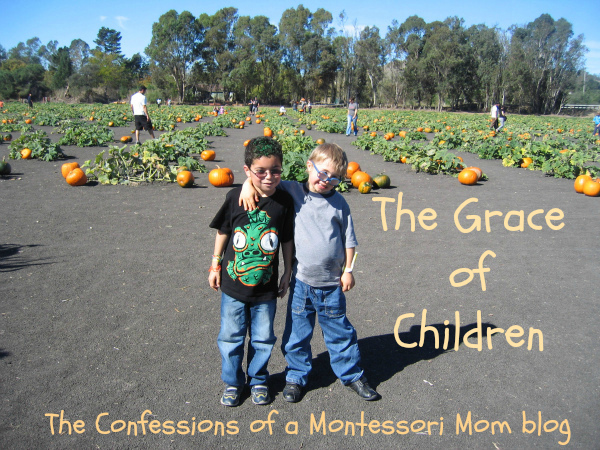 In Montessori elementary education the focus also changes as children at age six span out from the me, myself, my family, my school to the Universe, the planets, and the stars. It is a complete u-turn. It is also the age when Montessori teachers introduce the People of the Word, where they live, how they live, as well as their needs: food, shelter, transportation, clothing, and defense. Here is where I would include other children who are different: who have Down syndrome, who use a wheel chair, or who speak a different language. Compare it to nature. We have so many different animals, plants, flowers, birds, and trees: oak, pine, apple, and how boring the world would be if all the trees were the same. And what if every sunset was the same? So it is with us: different color skin, hair, eyes, languages, as well as different and unique abilities. Ask your children to think about how enriched our lives are because of diversity, to picture an orange Monarch butterfly resting in a pine tree; the red hot lava flowing from a black volcano; a green humming bird hovering over a pink rose; a yellow leaf falling from a brown branch; a little girl sitting in a steel, blue wheelchair; a tan boy with black curls speaking with his hands; a toddler with a purple bonnet wearing glasses and crawling across a white kitchen floor. This helps children develop tolerance for diversity. You can share the diversity in your extended family through stories about grandma growing up on a farm and uncle Joe cooking Italian food from his home country. 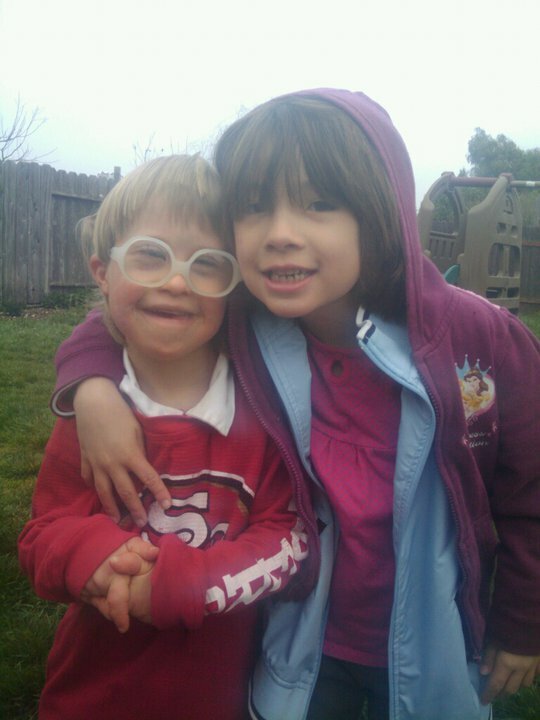 You can discuss the little boy in your child's class who has Down syndrome and needs extra help so he has a special person with him called an aide. If we educate and expose and talk about diversity in the world starting at five and six when they are hungry for information about the world and beyond, the more accepting your children will be, and more enriched their lives would be. It's morning time and my son and I are getting ready to walk to school. He puts on his jacket, I assist his little hands, and together we zip it up. His backpack goes on next, then he grabs his lunchbox, and we are out the door. On the way to school my son says hi to everyone who passes. As we reach the school yard children and parents file in and my son is greeted with hugs, high fives, and the grace of children.